It has been years since I read this, but I loved it! I've only read one Pern book, although I did read all of Yolen and Wrede. Did you ever read Laurence (Lawrence?) Yep's dragon books? Those were absolutely fantastic. My cousin is in her horse period right now and it's adorable. Liviania: I never read Yep - I'll have to look up those books! Thanks for the recommendation. When I was in junior high I was very anti-dragon stories, so it took me a long time to try these books. Once I did though I realized that they weren't typical fantasy dragon stories. They were amazing & captivating and still some of my favorite books of all time to this day. Ahh! You're a Pern fan?! See, this is why I wish we'd gotten to hang out a bit more at BEA! I was crazy for dragons in general, and Pern in specific, when I was a teenager. 100% got my biggest push diving into writing through Pern fandom. I had the same experience with the Harper Hall trilogy. Loved them. And Misty of Chincoteague. I had my horse phase in grade 4. Thank goodness MH wrote so many books! I couldn't get enough. I hate myself for writing this but I've never ever read the Pern books. I know, I know what a horrible fantasy fan. I also never went through a horse stage, but did go through a whale and dog stage. Figure that one out haha. Anyways, I like how you mention reading it as an adult and picking up on the patriarchy and things you missed as a kid. 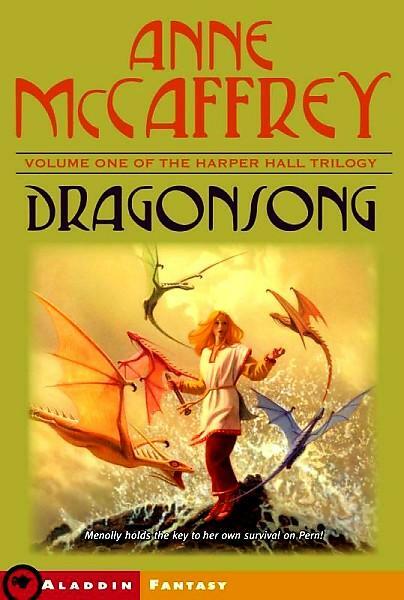 Methinks I need to read Dragonsong and the other Pern books to see what I've been missing out on. I'm now jealous of April's whale stage. I want a whale stage. Charlotte: That's too bad of them, isn't it? Alyce: I knew you loved McCaffrey - Pern is just special, isn't it? Allison: HA! Right?! Jealous here, too.